Maybe it's just me but there seems to be a lot of chatter on the internet about retirement, and how to prepare for it. So here is a quick recap on how you can use the DIY Income Investor approach to plan for that wonderful day when you can stay in bed every Monday morning. Preparing for retirement should be the main long-term goal for the DIY Income Investor - preferably with the goal of being able to retire early and enjoy the fruits of your financial acumen! To me, 'retirement' means freedom from financial/work obligations and having the income to do what you want (within reason). But here is the corollary: to achieve this you will almost certainly have to change the way that you live. Think about that for a minute: you will (probably) have to change the way that you think about money, consumption and saving. OK, you may have a range of immediate financial concerns right now including debt, mortgage, potential redundancy, kids, etc. But actually your biggest financial worry should be how you spend your decades in retirement! Over one-in-five retirees still work: the number of 65-74 year-olds who earn an income from wages, as well as a pension, rose from 18% to 22% over the year. Yet the Aviva survey found that few people start "actively thinking" about pensions until they are 48 years old, and take another four years before they do anything about it. And savings for older people (over 55) have fallen by 27% over the past year (average nest egg: £11,153), while incomes have dropped by 4% (average monthly income: £1,285). One in seven people over 55 have no savings at all, while even those who are saving are putting less aside every month (an average of £26.90 down from £31.17). According to research from Prudential, people retiring in 2012 expect to live on an average of £15,500-a-year (including private, company and State pensions) – more than £1,000 (6%) less than those who stopped working the previous year. One in five will have to get by on an expected annual income of less than £10,000. Fewer than two in five (37%) of the Class of 2012 say that they have saved enough to secure a 'comfortable' retirement. Worryingly, nearly one in five (18%) of those planning to retire in 2012 have no idea of the level of income they will need in order to live comfortably. The company's annual study also reveals that expected annual retirement incomes have dropped by more than 16% over the last five years. Retirees back in 2008 had the prospect of a total annual income of £18,600 – over £3,000 more than those planning to retire in 2011. What is more worrying is that more than a third (38%) of people due to retire in 2012 are cancelling their plans with a significant proportion (22%) of these doing so because they 'can't afford to stop working', the study concludes. 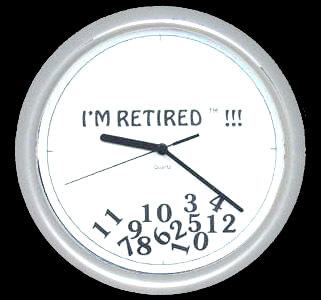 If you are not yet retired - are you worried? Pensions, both private and state, make up on average 60% of retirement income. So it makes sense to make sure you are maximising your potential pension contributions. As a simple rule, paying any income taxed at a higher rate into a pension is a no-brainer. So, pensions are a given: the rest of this article is about what else you do. The wealth potential is surplus cash which you can use to get started on your (after paying off any remaining debts). Alternatively, you might already have savings and investments and be looking for a new approach - one that makes sense! The key idea to retain is that the more you can sustainably reduce your expenditure, the faster you can achieve your target wealth - not can save more each month (because your have reduced expenditure) but you have to save a lot less (because you need less net income in retirement). Don't forget that the principles of DIY Income Investing apply equally well to investments in your self-invested pension fund (e.g a SIPP in the UK) - so you can use the same approach to manage your investments in retirement, without having to take an annuity. Thanks - a useful link! My retirement plan is still to have kids and then raise them to believe it is a familial obligation to take care of elderly parents. In order to increase their likelihood of absorbing that lesson I will of course have to take care of my own elderly parents visibly in front of them, but I like my parents so I am happy to. That's the traditional approach. But the way things are going you may have to look after your kids financially too! Or at least help them up the ladder. Yes - don't rely on your kids for your old age; you will probably have to help them financially! Treasure your family but don't expect anything back. Guys, I think Sophia's post was slightly tongue in cheek.